Man in TRANSIT. Adapted from Anna Seghers’ WWII-set novel, TRANSIT transposes the plot to an indistinct era that resembles the present-day. I am not a fan of transposed plots or of adaptations of literary classics to a different place or time. Writer/directors can aim at making their films accessible or more difficult. 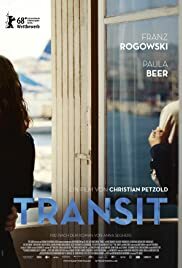 It seems the latter case for German director Christian Petzold’s (PHOENIX, which I admired) TRANSIT. To set his WWWII film to the present, he could have made that decision for an easier way out at fillming. For one, he has no vintage cars or expensive sets or war uniforms to worry about. But critics will always find an excuse to favour a script or an idea made more difficult to follow. TRANSIT has therefore, unsurprisingly garnered favourable reviews. Georg (Franz Rogowski) is a German refugee who escapes to Marseille in France, a port for migrants fleeing an unspecified war. Georg carries the documents of a famous writer, Weidl: a manuscript, the promise of an elusive transit pass from the Mexican embassy, and letters from the writer’s wife, Marie (Paula Beer). Discovering that Weidl has taken his own life, Georg assumes the author’s identity, grows ambivalent about leaving the continent, and develops an obsessive desire for the mysterious Marie — herself stranded in the city. The film is made more confusing with Marie having an affair with another lover, a doctor when Georg arrives. Georg also meets a young kid and his deaf/mute mother. It is clear that the film bears shades of the classic CASABLANCA where refugees are waiting for an opportunity to escape the Nazis and enter a better way of life through passage to another country. But this thrill and suspense are lessened when the war environment becomes foggy as the setting is not really WWII. Actor Rogowski has an uncanny resemblance to Joaquin Phoenix. He even sports a hairlip like Phoenix. His brooding performance, always at a loss of what to do next, even after falling in love with Marie helps propel this difficult along. He is the one good thing about this otherwise tedious film that leads nowhere, like always being lost as in the characters in constant transit. An art-house piece, TRANSIT requires a lot of work to appreciate. Many will just not be bothered with it.